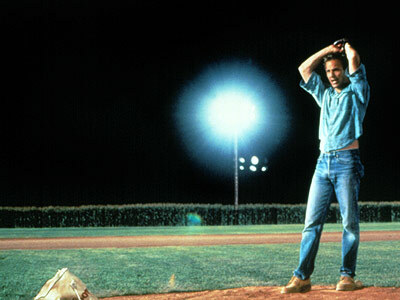 The other night, my wife and I watched "Field of Dreams" for the first time in a decade. I'm not a sports fan so I'm always amazed at how much movies like "The Natural," "Field of Dreams" and "Remember the Titans" get to me. I have no personal memory of being on a baseball diamond, feeling a ball connect with a bat or smelling the dirt and grass after a dramatic base-stealing, so what was it about this movie that made me cry; no offense to Costner fans, but he's not that great an actor. What I realized was that the movie wasn't triggering memories of stolen bases and crowds and team sports, it was triggering memories of my life as a writer and, specifically, my experiences at World Fantasy. "I am pitching to 'Shoeless' Joe Jackson." Ray Kinsella, by all accounts a grounded, sane and responsible family man, follows a bizarre and illogical compulsion and is rewarded by meeting one of his childhood heroes. He sits in the stands that he built and watches a historical Dream Team play in a field that he created. Not only that, he becomes friends with these men, getting to know them in a way he never conceived possible. For the last 6+ years I've been following a similarly illogical compulsion and have been rewarded by walking among a Who's Who of the creative community. Just like Ray's nostalgic recollection of his father's baseball stories, the names on the spines of my father's library have come to life--I've gotten to meet them, shake some of their hands, share my admiration and, most significantly, gotten to spend time with them. Unlike Ray, though, I've also gotten to spend time with my own heroes, both newly met and from my own childhood.